As marijuana legalization spreads throughout the country, recreational and medical marijuana marketers are battling legal red tape and stoner stereotypes to attract a new generation of cannabis consumers. A certain segment of the boomer population spent their formative years in a haze of hippie-filledpot smoke. Three decades later, skater dudes reveled in their stoner-stereotyped rebellion. Like the sweet, herbal, skunk-like stench that lingers on your T-shirt after a Grateful Dead show, marijuana carries with it connotations that are hard to shake as it enters the mainstream marketplace as a legal recreational product—not to mention a legally sanctioned pharmaceutical offering. Marijuana has been legalized for medical use in 24 states across the U.S., and for both medical and recreational use in Alaska, Colorado, Oregon, Washington and Washington, D.C. Meanwhile, possession of a small amount of marijuana in 11 states (California, Connecticut, Delaware, Maine, Maryland, Massachusetts, Minnesota, Nevada, New York, Rhode Island and Vermont) doesn’t carry a prison sentence, making those states likely candidates for complete legalization, according to Fortune. Even in these markets, the laws and regulations governing marijuana’s production, distribution and use are expansive and burdensome for companies that operate in this space—and for marketers working to promote it. Like alcohol brands, recreational marijuana dispensaries are battling negative perceptions while attempting to do their due diligence to promote responsible use of their products. And like pharmaceutical brands, marijuana dispensaries must battle burdensome regulations and continue a lengthy and arduous quest for FDA approval. Marketing agencies are sprouting up across the U.S. to help marijuana dispensaries promote more positive perceptions, and owners and employees at marijuana-based brands are working on sophisticated marketing strategies to nip stoner stereotypes in the bud. Bush’s comments elicited chuckles from both the audience and his fellow candidates, and made a few headlines the following day, but they didn’t cause much more of a stir. When a U.S. presidential candidate from the right can poke fun at his own pot use in high school, it’s a sure sign that the game has changed. “Surveys have shown that half of the people in this country have tried marijuana at one point in their lives, and as the laws change, more people will be comfortable with the idea of openly consuming and discussing their marijuana use,” says Mason Tvert, director of communications at Washington, D.C.-based Marijuana Policy Project, an organization that focuses on ending marijuana prohibition. Indeed, Tvert’s assertion is backed up by data from the 2012 National Survey on Drug Use and Health​, conducted by the U.S. Department of Health and Human Services Substance Abuse and Mental Health Services Administration, which found that 49% of the American population reportedly has tried marijuana, making it the most commonly used illicit drug in the U.S. Acceptance has risen since the haze of the hippie ’60s. In a 1969 Gallup poll, only 12% of Americans favored legalizing marijuana. In April 2015, 53% of Americans said that marijuana should be legal, according to a Pew Research Center study. But even though Americans might have tried it and might be in favor of legalizing it, they don’t necessarily think that their neighbors should be smoking it—at least not for fun. 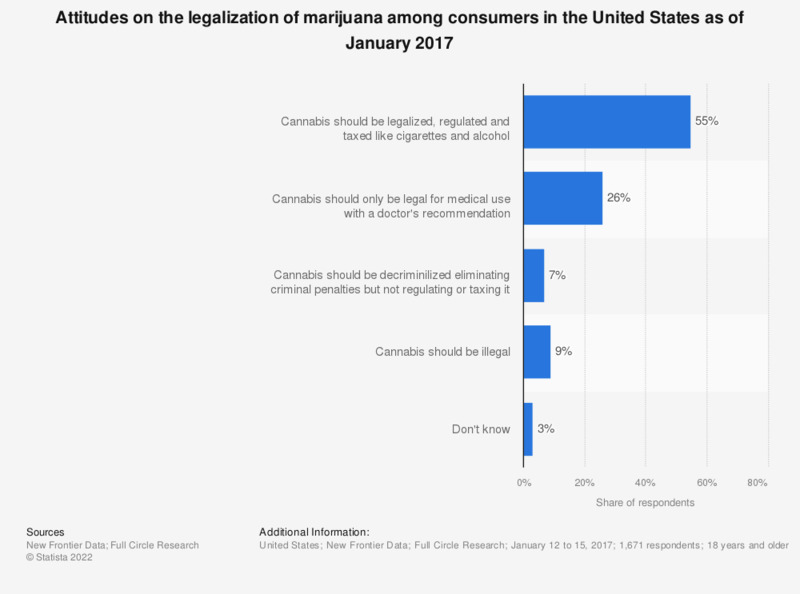 According to an April 2014 study by National Public Radio and Truven Health Analytics, 78% of people support the legalization of marijuana for medical use, but only 43% of people support legalization for recreational purposes. Three Denver-based companies are taking on both the regulatory and consumer perception hurdles of marketing medical and recreational marijuana. Cannabrand, a marketing agency dedicated solely to cannabis industry clients, opened its doors two years ago as legalization picked up steam. GroundSwell Cannabis Boutique, a medical and recreational marijuana dispensary, works to change negative pot perceptions by offering professional-level customer service via sleekly designed, welcoming storefronts that could just as readily offer handbags and cosmetics in their modern shelving and display cases in place of pot-infused products. Inhale Mercantile, an online “headshop,” the term for a store that sells marijuana accessories, promotes its luxury cannabis accessories primarily to women—no stoner stereotypes in sight. All three are using savvy marcom strategies, and heavy doses of creativity, in an attempt to spark the U.S.-based marijuana industry’s growth. College students the world over often scheme of launching businesses with their peers, and when you attend college in Colorado these days, you’d likely be concocting ingenious ways to enter the nascent industry for which Colorado has become an unofficial home base. Olivia Mannix and Jennifer DeFalco decided to leverage marijuana’s legalization there to found their own niche marketing agency, which they called Cannabrand. Both 2011 graduates of the University of Colorado-Boulder, with degrees in advertising, PR and communications, Mannix and DeFalco first launched MARCA Strategic in June 2013, a general marketing agency that’s still in operation, and then created Cannabrand as a specialized offshoot on the eve of marijuana’s legalization in Colorado in January 2014. Cannabrand now has 20 clients, including dispensaries, marijuana growing operations, and companies that sell vape pens (pre-filled pens that contain pot and are similar to electronic cigarettes), extracts, edibles and other marijuana accessories. Most of Cannabrand’s clients are based in Colorado and California, but the founders are in talks with brands in Washington, and in Florida and New York, where recreational legalization could be imminent. Olivia Mannix and Jennifer DeFalco of Cannabrand. Photgraphy by Jon Rose. To build their client base, Mannix and DeFalco first networked with industry leaders in Colorado, including those who already were selling marijuana for medical purposes. “We said, ‘Cannabis is about to go legal for recreational use, so what are your plans for transitioning from medical to recreational?’ We talked to different dispensaries about how rebranding would help them appeal to this new market,” DeFalco says. In the consumer packaged goods space, brands, logos and general panache are important, so the two businesswomen wanted to work with dispensaries to help them create compelling visual brands and brand stories. They also saw he need for full-fledged marketing and advertising campaigns. In July 2015, Mannix and DeFalco prepared what was to be the first TV ad for a marijuana product for its client Neos, a Denver-based vape pen maker, which sells its products in Colorado and to medical dispensaries in California. The ad, which was scheduled to air prior to Jimmy Kimmel Live on local station ABC-7 in Denver, was pulled at the last minute because of FCC concerns (pot is still illegal nationally). The ad showed images of the Colorado skyline and focused on nature and outdoor experiences, featuring twentysomethings at a concert and camping. A voiceover said: “You lead an adventurous life, always finding new ways to relax. Now enjoy the best effects and control with Neos portable vape pen, and recreate [as in, use recreational marijuana] discreetly this summer. Neos: Recreate Responsibly.” The tagline read, “A bold new way to unwind,” and the ad ended with a 21-and-over/Colorado-only disclaimer—similar to those “drink responsibly” messages for alcohol—and did not show the product. Even though the drug is legal in Colorado, marijuana marketers must abide by stringent advertising rules set by the state of Colorado and other marijuana enforcement agencies. Cannabis brands must prove that at least 70% of the audience for each outlet in which they’d like to advertise is 21 years old or older. Facebook won’t accept marijuana-related ads, and outdoor advertising is not allowed. Because of cannabis advertising restrictions, Cannabrand steers most of its clients toward industry-related publications that will accept marijuana-related ads, such as The Cannabist, Culture magazine, THC magazine, Marijuana Business and Dope magazine. Some publications, such as the Denver Business Journal and Westword, a Denver lifestyle magazine, publish ads for local dispensaries and marijuana products, as well. To market their own agency, Mannix and DeFalco also rely on ways to prompt word of mouth, using their networking skills and industry knowledge, doing speaking engagements at conferences such as the International Cannabis Association’s C​annabis World Congress and Business Exposition, and attending legislative events in Colorado. They were present at the passing of the Limited Social Marijuana Consumption Initiative, which allows for adult cannabis consumption in a public or private space in Denver, including designated smoking areas in bars, and they work with activists and lobbyists on a local and state level, such as the Cannabis Patients Alliance, a group that helps provide patients with information about marijuana and connect them with doctors. Change—a lot of it—will be necessary before medical marijuana is marketed like other prescription drugs. Medical marijuana brands face one major hitch: the lack of approval from the U.S. Food and Drug Administration. Two FDA-approved medications that contain cannabinoid, a chemical in marijuana, are used as an appetite stimulant and for treating nausea in cancer patients, and there’s interest in the drug industry to use marijuana to treat several symptoms from medical conditions, such as glaucoma, AIDS wasting syndrome, neuropathic pain, cancer, muscular dystrophy and seizures, but the FDA hasn’t yet recognized or approved the marijuana plant, itself, as medicine for any condition, says Michael Roth, healthcare practice leader at New York-based marketing agency Bliss Integrated Communication​, whose clients include Eli Lilly and Pfizer. “Getting medical marijuana FDA-approved is going to take many years and a lot of money,” he says. “Even if they get approval, they’ll be limited to what they can say about what’s approved for what [condition].” Although drug companies cannot yet get involved in the marketing due to the lack of FDA approval, some smaller drug companies are researching marijuana as a treatment for several conditions, he adds. When you talk about customer service with regard to cannabis, that likely conjures images of seedy street corners or Ziploc bags put to unintended purposes. The stereotypes surrounding marijuana are deeply rooted, so consumer perception could be marijuana marketers’ biggest challenge. Although the twentysomething male stoner culture still exists, of course, cannabis marketers are working to shift perception of their customers from those slacker types to a mix of white-collar executives, suburban moms and grandparents. “Yes, there’s always going to be that culture there that’s a fundamental part of why we’re here now, but the reality is, for everybody else who’s over 21 and potential customers, we have to find different ways of talking about it, particularly the experiences,” Sodano says. GroundSwell’s recreational space is designed to be welcoming. Photography by Jon Rose. Find more statistics at StatistaThe tide could be turning on the perception issue as the next generation comes of age, research shows: Support for marijuana’s legalization rose 11% between 2010 and 2013, with 68% of millennials supporting it, versus 52% of Gen Xers and 50% of baby boomers, according to a Pew study from February 2014. Sixty-nine percent of Americans believe that alcohol is more harmful to a person’s health than marijuana, and 57% say that they wouldn’t be bothered if a store selling legal marijuana opened up in their neighborhood, according to Pew. Photo courtesy of Marijuana Policy Project. In June 2014, New York Times columnist Maureen Dowd wrote a column​ about overdosing on edible marijuana in a Denver hotel room, chronicling her experience of hallucinating and becoming paranoid after consuming too much of a pot-infused candy bar. The Washington, D.C.-based Marijuana Policy Project (MPP) used Dowd’s column to create ad campaign to warn so-called “pot tourists” about the negative effects of over-indulging. In September 2014, MPP unveiled a billboard in Denver with an illustration of a woman who looks like Dowd slumped over on a bed, and the tagline, “Don’t let a candy bar ruin your vacation.” The ad directed viewers to MPP’s website, ConsumeResponsibly.org, which has tips for responsible cannabis consumption.